Midterm season is here and everyone is busy studying until our brains are fried. Sleep sounds like a foreign concept at this point and everyone's kind of on edge. I've definitely been missing out on the sleep department with loads of school work on my plate, but I'm looking ahead and counting down the days until it's all over. With New York weather acting all bipolar and the Fall weather creeping in, I kept it extremely simple. I mean, when do I not keep it casual these days? The weather has me confused most of the time and I've been having fashion block (still) so it's days like this where I tend to put on an all black outfit, adding a little pop. 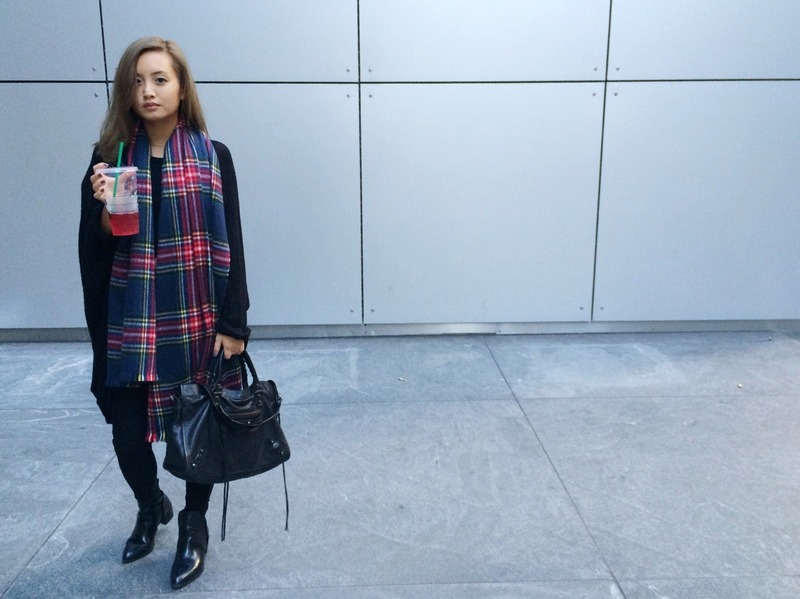 My plaid scarf is from Primark that I got for a steal this summer while I was in Paris. I loved the blue plaid since I stray towards darker colors than brights. Sad they don't have a Primark in the States, but it's okay, I'll live.